We’re getting closer and closer, at long last, to Star Trek: Discovery’s arrival, and that means more and more glimpses of the show’s shiny new take on Star Trek past. On Monday we got a new-and-improved look at the titular ship, but now we have a great look at the show’s new-old take on Star Trek’s iconic tech. Ahead of the show’s appearance at Comic-Con this week, the Discovery Twitter account has been releasing brief snippets that give us some very close looks at the tech Starfleet’s finest will wear during their boldly going on the show. First up was the delta badge (originally just the badge of the Enterprise, but now retroactively taken as the general Starfleet logo), which, you know... looks like a badge. 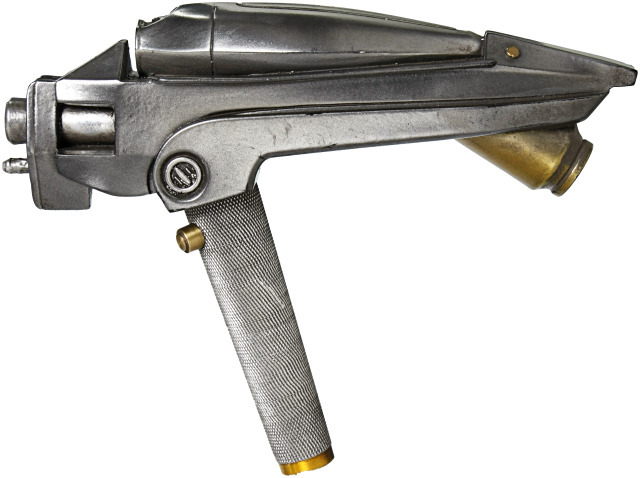 And then, yesterday, we got our look at the classic Phaser, which probably includes the most significant changes from its Original Series predecessor (or successor, I guess, given Discovery’s early place in the Trek timeline). Texturally, it’s definitely a lot more varied than the original phaser pistol—sacrificing some of the simplicity of the original for a more varied -looking design while keeping most of the classic design elements. But the biggest change is in the actual barrel of the phaser itself. Gone is the little nib, replaced with three asymmetrical cylinders that make the new phaser almost look like an old-timey camera. Maybe they’re for different settings of phaser intensity? While it definitely evokes the iconic original, it feels in a lot of ways like the phasers designed for USS Kelvin personnel (but not actually seen) in the 2009 Star Trek movie. The other tech shares a similar aesthetic, which makes a certain amount of sense, considering that Discovery is set in a similar period to when the Kelvin was operating—before, you know, that whole parallel universe thing kicked in. Star Trek: Discovery finally beams to Netflix on 25th September. Seriously, nobody at Starfleet thought this was necessary? Not the chair, not the costume, not his posture. It feels oddly appropriate.